Mrs.CBB and I were working on low carb baking ideas that we could make for the holidays when we decided to create one of my favourites, coconut macaroons. Many moons ago when Mrs. CBB was working at Tim Hortons she remembers making coconut macaroons and dipping them in milk chocolate. That was part of her role when she worked the night shift with the baker back when they used to make donuts, cookies and muffins fresh in the restaurant. Chocolate coconut macaroons were an everyday cookie on the popular coffee shop menu and were sweet, chewy and had a crunchy exterior. Mrs. CBB said it was also hard to resist just eating one. My challenge was to recreate coconut macaroons but a sugar-free and low carb version. When I lived in the UK I used to make the sweet version of coconut macaroons because they were delicious and inexpensive to make. I didn’t have fancy scoops though and would just roll them and pat them down but I like this version better. You can buy a bag of coconut in Canada for $1.00 which would be about 2 cups of coconut. If you buy it in bulk it’s even cheaper if your store offers a coupon or has a sale like The Bulk Barn does in Ontario. 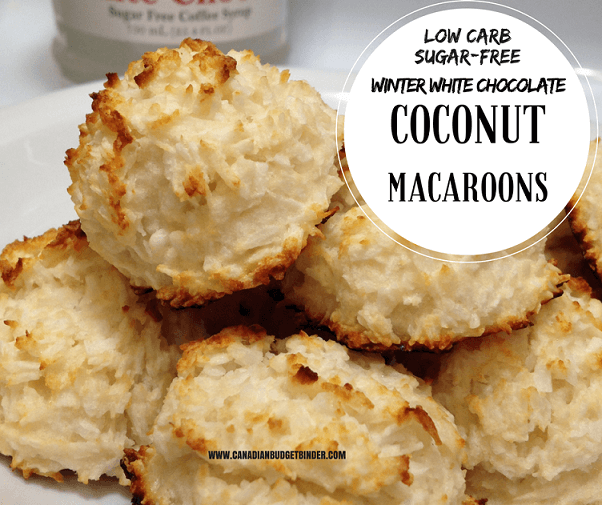 When making these low carb coconut macaroons keep in mind they are sugar-free which means you must purchase unsweetened coconut or you’ll end up with coconut coated in a light sugar. I was on a mission to create chewy coconut macaroons that were sugar-free and low carb. These coconut macaroons aren’t too different from the regular sweetened version apart from I used the entire egg and not just egg whites and substituted sugar for Jordan’s Skinny Winter White Chocolate Syrup. If you don’t have the syrup you can use 6-7 drops of liquid sugar substitute or packets of sweetener in its place. What we love about these coconut macaroons are that they are holiday friendly which means we will stock up so we have something delicious to eat that is sugar-free. Likely, most of our guests won’t even know the difference. To help keep the coconut macaroons in the lovely scooped shape I added a tablespoon of Coconut flour which also helps create the chewy texture. We use Yupik Coconut Flour which we buy from Amazon as it’s reasonably priced at just over $10.o0 for 1kg. Coconut flour tends to soak up liquids so if the batter seems to be a bit wet this will help. There are no other flours or wheat added to the coconut macaroons which means they are perfect if you want a simple gluten-free cookie. I used an 18/10 stainless steel scoop to form the coconut macaroons and a silpat to bake them on so they didn’t stick to the baking sheet. You can buy the baking mats just about anywhere that sells bakeware but not all places carry the original Silpat which can be pricey, but worth the cost. We bought two Silpats online for just over $20 each but keep in mind they will last you forever and help preserve your baking sheets as well. You can also opt for the competitor brands of baking mats at around $18.00 for a 2-pack but I’m not sure how well they work but the price difference is evident. You’ll want to bake the coconut macaroons at 350 degrees until the tops were golden brown and then lowered the oven to 200 degrees to create a chewy interior. We found that if you left the coconut macaroons for a couple of days in the freezer that they seemed chewier. Yes, you can freeze coconut macaroons. We fill a zip bag full and put them in the freezer and eat them cold although they are as delicious at room temperature. You can store in the freezer up to 3 months. If you don’t want to put the coconut macaroons in the freezer simply keep them in an air-tight container in the refrigerator if you like them chilled or on the counter up to 3 days. These sugar-free coconut macaroons are chewy on the inside with a bit of crunch on the outside. ¼ cup Winter White Chocolate sugar free syrup or any flavour of choice or 6-5 drops of liquid sugar substitute or 6 packets of sweetener. In a mixing bowl add your unsweetened coconut, melted coconut oil, melted butter and warm water. Mix and let sit so the coconut soaks up the moisture about 5 minutes. Add in the beaten eggs, vanilla, salt and coconut flour and mix. Using a small scoop place even scoops on a silpat lined baking sheet or sprayed non-stick baking sheet. Lower the oven temp to 200 and leave for another 10 minutes. Dip in sugar-free chocolate or drizzle. You can always change the flavour of the macaroons by adding different extracts or sugar-free syrups. What I love about these coconut macaroons is that you can swap out the flavours. You might feel like plain sweet coconut macaroons or lemon macaroons by adding some lemon extract and lemon rind. You can also add unsweetened cocoa powder to create chocolate macaroons. We also have cacao nibs which we grind and use as cocoa but it’s very bitter so if you do use it add a bit more sugar substitute as needed. Discussion Question: What would be your favourite macaroon flavour? For the warm water and coconut oil are the measurements 1/4 and 1/2 of a cup? It looks a bit small sorry that is jut my plugin. It is 1/4 cup and 1/3 cup plus the butter.